You are here: Home / Sluiters / Eddie / Santa or Satan? 1. Santa’s name was Marvin. We know this because “Mrs. Claus” yelled it at him. 2. This is put on by the Holland Civic Theater. They are a theater company and this is the best actor they could get for Santa? Really? 3. I don’t think Santa…I mean MARVIN…likes kids. 4. Mrs. Claus, bless her soul, was very sweet and did everything she could. 5. My son is wearing a polar bear sweater. Shut up. I like Christmas sweaters on the little guy. See? 6. Thank all the 8 reindeer and Rudolf we were the only ones there. Otherwise I am afraid Eddie would have convinced the other children that Santa’s lap was made of rusty nails. 7. Clearly I am the only one having fun here…and that isn’t even real. I was having NO fun. I am just a better actor than Santa aka Marvin. Please tell my your kid does/did this too. please. Oh my! I will never understand why they hire Santas who hate babies and kids! 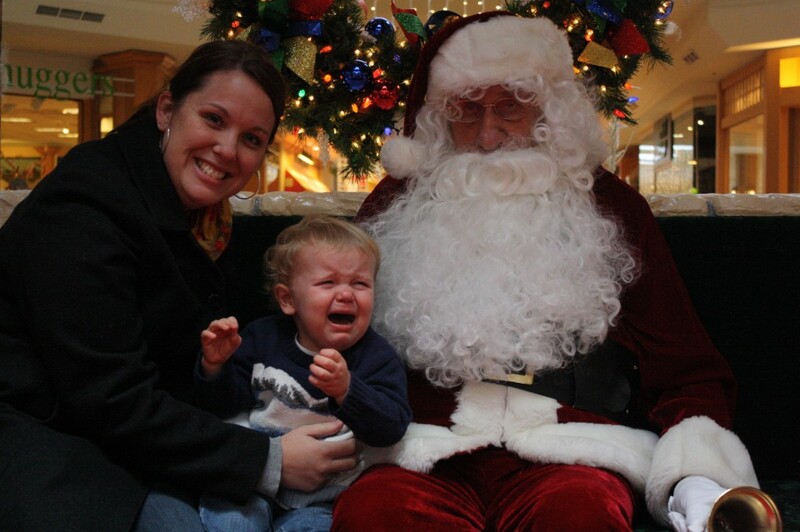 Cameron didn’t really like Santa last year either. He would’ve cried except he was 6 months and I was like 2 feet away, just barely out of the photo. I’m sure we will have a photo like yours this year since he is now 18 months. yeah, last year Eddie was fine with Santa (at 6 months). this year? not so much. and my kid loves EVERYONE. everyone but santa. Heh, calling Santa “Satan Claws” was my grandfathers favourite Xmas joke. Made my grandma fume every single time. I wouldn’t bring C anywhere near a mall Santa, but that is because I HATE people in face-covering costumes. So probably *I* would have been hollering just as much as your lil fella! Poor Marvin. Someone clearly took away his booze. Satan Claws? I LOVE it! Yeah, Marvin looked like he needed a beer. or at LEAST a cup of coffee! Mine would for sure, so we don’t even try it. I did when my oldest was a year old. Never done it since. It was really, really bad. It looks like they propped the guy up, really? He is the ugliest Santa I have ever seen. yeah, he was terrible. he could have been a super nice guy, but as Santa? no good. I love these pictures !! My husband had one of him screaming on Santa’s lap, and I have one of myself at about the same age. We then have one of each kid, and they are all up on the wall. Cracks everyone up that sees them. I also sort of love these pictures. I wish someone would do a link up so I can see everyone’s kid/santa pics! Does it make you feel better to know that the only way we kept Darling Girl from sobbing through her Santa visit was a bag of popcorn? The lovely lady who took the photo promised she would do her best to crop it out. Our Santa was possibly the nicest, best Santa in the history of the universe. He had a real beard! There were a ton of people, but he took the time to be nice and extra careful since DG was on the verge of tears. He showed her how soft his suit was (on the arm, you pervs), let her check out his beard, and asked what she wanted for Christmas. It was fantastic! I hope he’s there again next year! Worth the wait! Last year the Santa we went to was super duper nice too. He was all kindly looking and loved all the little kids and was awesome! Eddie was not scared at all…even at 6 months! This year? Santa was a creeper. And my kid knew it. Of course that is the way my kiddo acts which is why he hasn’t seen Santa in two years! i can barely remember my parents ever taking us to see Santa and I am sad about it. That is why I do it. But if we have a breakdown next year? that might be the end of Santa visits. We have never, NEVER had a successful Santa visit. This is our fifth Christmas with children. So far, only our darling eldest has freaked the freak out every. single. year. But I’m thinking the other two might decide to join her sometime. So this year? I said no Santa visits. Bah, humbug. And now my big girl decides she does, in fact think she can sit on his lap without screaming because she’s “pretty much grown up now.” So do I dress them all, pack all three of them up, stand in line, and hope for the best? “freaked the freak out”. He he. it will be funny someday…right? RIGHT? Please tell me this will crack us right the freak up someday. Okay, so we are Jewish and my kids are a little leery of Santa as well. But they are 5. Yet I’m quite sure there are many parents who have been in similar situations. I think it’s kinda priceless and will bring laughter and stories for years to come. Shame on Marvin for not being more helpful!!! Santa is by far the creepiest part of the Christmas tradition. By far. I mean he’s an old man that breaks into your house in the middle of the night. and he “sees you when you’re sleeping”. Creepy. Yeah, I can imagine that once he is older? this picture will make us crack up. That makes me happy…creating fun memories. Even if they involve a freak out. And do you blog about your Jewish traditions? From what I know, I find Judaism to be so beautiful. he he…yeah, no man bewbs…just a total dud of a santa. Marvin scares me. And he looks like he’s about to pass out at any moment. he scares me too. and yes, he looked like he might fall over. weirdo! Oh Marvin, he’s always grumpy in December. It’s having to work on a holiday, you know. i totally understand. poor Marvin. someone pass him some coffee. For the record, I also like Christmas sweaters on little people…just wouldn’t wear one myself. Marvin is a total dud. Boo. I was not really a Marvin fan myself. And yes, Christmas sweaters on little ones are adorbs. On adults? Not so much. OH, I have exactly two pictures of my 9 year old son with Santa. The first he is about 19 months old and you can’t tell who was more ticked to be there, him or Santa. Then two years ago he DEIGNED to have a picture with his younger brother. And that was it. Trust me, you’re soooo not alone. phew! it is reassuring to know that my boy is not the only one losing his shiz around santa! Me? I won’t be anywhere near that fat man. If my kids get an opportunity to sit on his lap, I’ll be far away. santa is creepy. hands down.